Established in 2012, ASUS Open Overclocking Cup was at first a local event for enthusiasts from Russia and Ukraine. It went international in 2013, becoming Europe’s major overclocking competition with the best overclockers from 15 countries of Europe and the CIS participating. 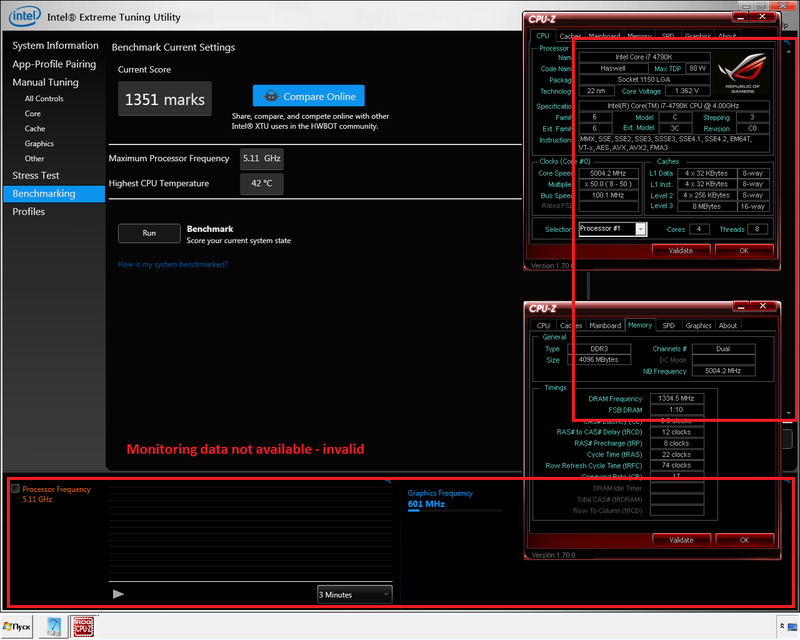 The qualifications for ASUS Open Overclocking Cup 2014 will take place from August 15 to September 15, 2014, on the basis of the largest overclocking database HWBot.org. Overclockers will need to show their best skill and experience to qualify for the final event. They will also be competing for ASUS's newest Republic of Gamers mainboards based on Intel’s X99 chipset. These extra prizes will be awarded to the leaders of the first three weeks of the qualifications. The top 14 overclockers who achieve the best results with the Intel Devil Canyon processor will proceed to the final. The top two overclockers who achieve the best results with the Intel Pentium G3258 will also be able to compete in the AOOC 2014 final. The prize fund of the AOOC 2014 final amounts to an impressive USD $10,000 with valuable prizes from ASUS Republic of Gamers as extra bonuses. Week #1 ends on August 22, 4PM UTC. Week #2 ends August 29, 4PM UTC. Week #3 ends September 5, 4PM UTC. If you are winner of 1st week and still leader of 2nd week, the second motherboard will be provide for second position. 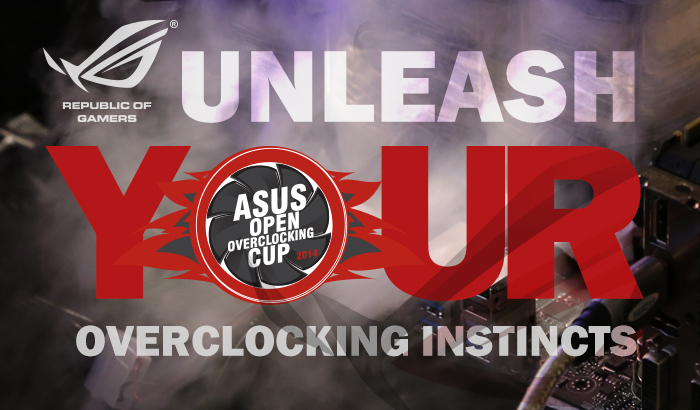 The Top-14 of the contest qualify for the ASUS Open Overclocking Cup 2014 Final. The winners are divided in two groups. Group 1 is formed by the positions 1 to 7, Group 2 is formed by positions 8 to 14. Starting with the winner of the qualifier going to #7, the overclockers in Group 1 can select a team member from the pool of overclockers in Group 2. The overclockers will be paired in a team to compete at the Final. On a daily basis from September 16, starting from the winner ending with position 7, each Top-7 overclocker must make a post in the official ASUS Open Overclocking Cup 2014 Qualifier forum thread announcing their team mate. If no post is made, the participant will be skipped and the choice will go to the participant next in line. For clarification, here's the team mate selection agenda. One wildcard is available for overclockers who compete with the Pentium G3258 Anniversary Edition. The wildcard team is formed by the Top-2 Pentium overclockers. If you are part of Group 2, you are not allowed to reject your Group 1 team mate. By participating in the competition, you agree to comply to this pairing method. Overclockers need to choose between competing with the Devil's Canyon or the Pentium CPUs. Only participants who compete with the Pentium exclusively are eligible for the wildcard. ASUS reserves the right to reject anyone from participating. The decision does not require justification and will not be discussed. 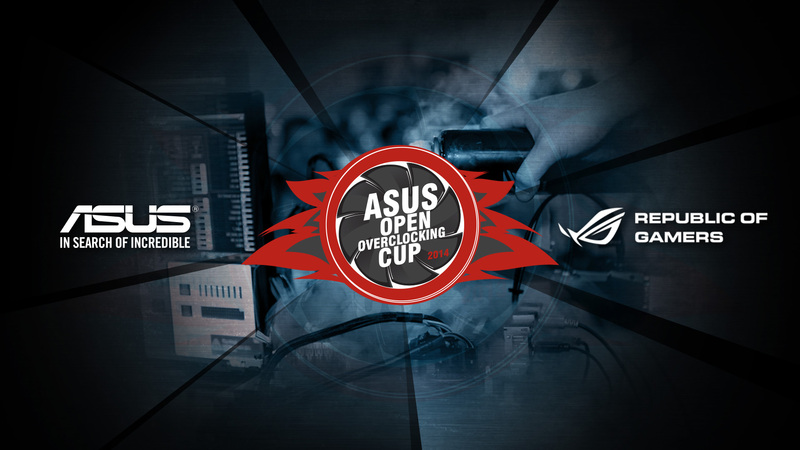 ASUS Open Overclocking Cup 2014 Qualifier is closed since 15 September 2014. Core i5 4690K most useless (. How does one distinguish G3258 people from 4690K/4790K people? What if I use G3258 for two stages and 4790K for a third stage, to which group do I belong? I guess you have to use the same CPU for all stages. Will hardware sharing rule be like HWBot one, so 2D no CPU sharing and 3D no CPU/GPU sharing, or will this rule also apply to PSU, SSD, memory and all other stuff? If you want to apply for the G3258 category, you must use that CPU in all stages. I think this is on the competition page. What is the point distribution for each of the stages? Last year the teams that were in most cases from the same country,were getting the one pair of hardware(vga+mobo) before the final to test and prepare.What is going to happen this year that the pairs in most cases will probably not be from the same country? We not will send before final one kit in this time. Every final team will be in the same conditions. 3. It`s something new. Will be not intresting, if AOOC will be same from year to year. It`s something new. Will be not intresting, if AOOC will be same from year to year. I definetly love this ! The team pairing is interesting at least ! Very nice you guys made it again this year. You are doing an awesome job, this helps a lot our community slamms. Hope Asus do the same in us or Asia. very interesting guys...love the comp...but again bad timing why so much comps in the middle of August? Guys, i am happy to see a lot good words about AOOC Lets do it better together! Me and my new G3258 are ready for this! I'll be picking up a block of dry ice on saturday. Will it be allowed and/or mandatory to use own hardware (such as CPUs or VGAs) in live finals? Sam, only provided hardware. But if you want you can bench own hardware on next day. We will live in same building, and Moscow Cyber Stadium is open 24 hours, like it was in Cyber Arena in 2012 year. Sam OCX : as long as you dont fall the stairs and end up in the hospital you can bench non stop. Good luck to all! Nice competition Asus! Is it allowed to use Maximus VII Impact boards for live qualifier? Competition has already begun but the boards are not commercially available. Congrats for keeping the competition alive Vlad.Will try to qualify. You're not stupid, I am. Anyway, nice rules, low clock, GPU bench (not cpu limited), and cpu test. Like it. I also will join the game this year! Thank you very much Vlad for bringing up this very cool event again! With the background of some awful events still going on its a very good sign for the rest of the world that the great overclocking community meet from CIS and Europe to do together what they love!!! Tomorrow will be the first decision right? The total leader will get a price then, or just the leader of stage one? XTU stage will be tight... what happens when e.g. three overclockers reach same result? Will the first uploaded result be in higher position (would be cool because no benefit from sandbagging), or will all points added together and distributed to number of overclockers have same result? In my screenshot of XTU submission,the XTU window is not visible for some reason(although it was opened while taking screenshot) and I found out after session.Is it a valid submission? Same happens for me if I use "capture.exe". Noticed that during MOA qualifiers. Ok Roman,I will rerun after work. First of all thanks Vlad and Asus Russia for the great effort. Hosting such an event is never easy! Keep up the good work. I hope i'll make it once again and go to the final. I've a question, i cannot afford Ti Matrix, external power allowed? It's not written in the rules. It's like in your first example where the person who submits first gets the most points. Slamm's high level competition on more time. Thanks for push this kind of event to OC community. Power boards with ASUS VGA is allowed. That was my goal and I got it! Thanks for that awesome contest! What does that mean? Buggued run? no, bugged benchmark. With this tweak i can get different results from run to run - 1310 to >2000. And the tweak fully complies with the rules. I beleive 7.9 is not possible? This is still 5ghz run. I can cold boot to windows and show you same results running xtu without need of any actions prior to running xtu. Looks like XTU is not valid anymore. 2. Add one more and share what do you want? Let others decide. I won't use it for qualifiers but the tweak is simple enough to be discovered by others. And it allows runs with deviations small enough (I.e. +10 points to an average 1320) to be accepted by most moderators. Me personally vote for 2 benchmarks (pifast and fsx) with equal point distribution (50%/50%). I am prefer to just disable XTU points. Let`s wait for few more opinions. Anyway, i agree, that changing rules now, will be not correct. No matter what will be done...but said anyway! Does this issue only happen in Windows 8.1 / Windows 8? If yes the solution would be simple to ban the OS (again). We can always switch to another benchmark and also extend the qualification timeframe if required. That would not be an issue. Also switching from XTU 5 GHz to XTU full-out might be a solution. Depending on what exactly caused the bug we're talking about. I thought win 8 is banned anyway?!?!?! No it isn't. Will post a result with win7 within 20 minutes. Description of the tweak sent to der8auer as he is a part of hwbot team. Maybe you can recheck that? i'm for replace xtu with spi 32m @ 5ghz, in the finals there's always spi 32m and if the purpose of xtu @ 5ghz was see who is the more skilled with the same frequency, well the spi 32 can be perfect. I don't waste my time trying to compete with some bugged result. Adding another benchmark now...i think that's not a good solution for those that already did their scores! Deleting xtu ok...but adding another benchmark...limited again at 5ghz...we all know which psc kit will win! is more difficult than that, psc + skills win, psc without skills loose. the decision must be done by others! I just hope it's a good decision...and I'm ready for everything! Mh is the performance that much off if XTU reports 5,1? Doesnt look that bad to be honest. I think spi 32m lcc is a bad call... LCC without any safety measurements in a competition like AOOC can create "problems". I would say remove XTU and stage 1 completely or replace it with XTU Full Out. Xtu full out when you can do 2064 with 5ghz??? The best I did with this setup is 1314 so far - just a slightly tweaked win7. 1350 is too much for the clocks/timings anyway. And it could be 1340, which is worse for cheat identification... Now you know, the tweak works as it should and gives some boost but benchmark itself can't handle this most of the times. Yeah but at least XTU has some safety measurements like freq analysis, freq report, etc. Let's stay with the other two. Guys first we will try to find a solution for this issue. Is it just me, or is it really easy to detect TR's bugged runs? In all of the bugged ones, the "maximum CPU frequency" exceeds the allowed frequency. And of course it's not possible to tell the frequency if the monitoring is disabled. Just check the Maximum CPU Frequency and the monitoring line. 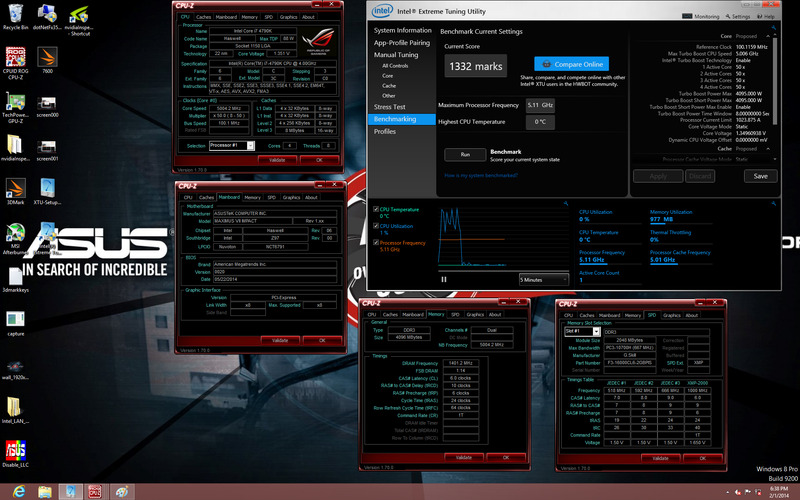 Pieter mine run is 5 GHz straight from bios... no tweaks, no changing settings in OS, just boot to OS open XTU and run. and I have 5.11, others seem to have similar. So you theory seems to be wrong. Alright guys, the tweak is actually easy to detect. First let's take a look at XAs result which is valid. I marked the mandatory and important validation details. This stuff has to be visible! Otherwise your result might be considered as invalid. Maximum Processor Frequency is 5.11 GHz. All monitoring data on the right is correct and visible (Max turbo Boost freq ~5.0 GHz). The monitoring data is fully visible on the right with also 5.11 GHz core and ~5.0 GHz cache. The monitoring line on the left is also fully visible and the CPU Frequency is a straight line without peaks. Monitoring details are not available and also system details on the right are missing. Example #2 with applied "tweak"
The Maximum Processor Frequency is out of line with 5.32 GHz (Maximum allowed is 5.11). 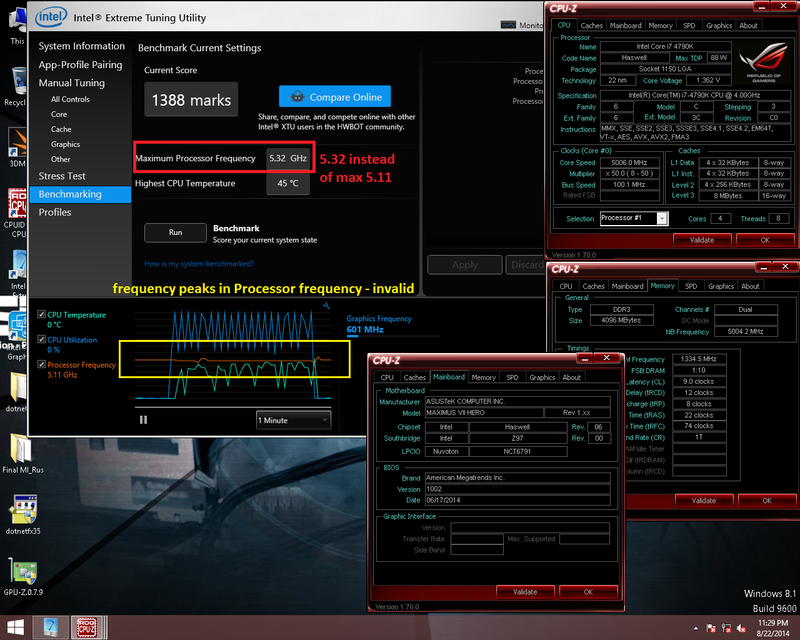 Take a look at the Processor frequency line which has two peaks (bumps from 5.0 to 5.3 GHz) which cause the wrong result. Also the details on the right are not visible. This is invalid aswell. So the tweak is very easy to spot and we can just continue here. - Monitoring data has to be fully visible and a straight line without peaks. That looks easy to check, good. Seems ok! Good work Roman!! Your line is almost straight which is okays. No bumps visible. However Max CPU 0 is strange. Yea you and Dancop seem to have this issue with the strange values. I think it's a windows related issue or due to disabled services. Can't be hardware since other guys also use the Maximus VII Formula with the same BIOS version and it works. Okay so the question is how we can get rid of the 0 GHz and 42424125125 GHZ results. Let me know if you have any idea what causes this. At my setup everything works fine so far. I have all mandatory things except max cpu freq! The straight line ist there! I tried my system on air and water again and again and I always get 0 ghz or fantasy figures! How...if it is mandatory, can I change it? On my 1335 score, I simply bootet and ran xtu. I did nothing else! No affinity, no service shut downs...nothing! So...if it is a duty, tell me how to change it to the right figures?! Did you apply any tweaks to the OS? Like disabling services? I just tried the high mem freq. It was the first run exactly after boot...just to check stability! And it worked pretty fine. What about all BIOS settings @ stock? If the leader for the 3 weeks will be the same person will he get all the three prizes ? "Week #1 ends on August 22, 4PM UTC. Week #2 ends August 29, 4PM UTC. Week #3 ends September 5, 4PM UTC. If you are winner of 1st week and still leader of 2nd week, the second motherboard will be provide for second position." Did you guys made a decision for the XTU problem? As long as your result is like the first picture you are safe. Just not sure yet how we can solve the 0 GHz and 4565354325 GHz results. Alright... have seen this like a kind of suggestion or idea and not as a final statement. I will take care of these information in the screenshot! Will all new uploaded scores will be checked? Or is there just one check for plausibility and errors/mistakes/tweaks at the end of the competition? If the first point is true I will upload some stock/light OC scores just to check if all Screenshots and Validation-Files are ok.
You mean that we get "0" value or "crazy number" is not valid ?? Just keep the mouse on the monitoring lines for utilisation, clocks and temps, while the benchmark were load! Then a vertical white line appears, which will also be on the screenshot. The line shows you the actual clocks while load on the left of the monitoring window...when you move it from left to right, you see changing, at least, the utilisation of the cpu! With that way, we all know, what were the clocks while load...pretty easy...isn't it? I'm getting 0Ghz also. Normal boot, no diagnostics mode or disabled services. I've seen similar behaviour when you run HPET off, but I haven't messed with HPET in Win and I belive it's on in bios. HPET should be enabled for Windows 8 based OSes for XTU to work correctly. I was on win7 though. And HPET is enabled in bios. Haven't messed with enabling it in windows. Perhaps I should enable it in windows. Hmm, even with HPET enabled in BIOS and in windows I'm getting 0Ghz. Chipset drivers and IME installed. I've had it working before, tried in on w7/8.1, M5G/M5E/M7R and wont work on any of them now. Strange..
Did you submit via the normal way or via the competition submission way? For datafile competitions it's best to submit via the competition page. Will this be a problem in FSX Validation? I have some valid results and at some point the results are not valid anymore. I benched even without restart. First result is valid, second result (100 points higher) have time measurement problems. Are you using Windows 8 or Windows 7 ? Does anybody have direct contact to Futuremark? Contact page on futuremark.com is weird! The time measurement error occurs if the system is getting unstable during verification. The system was rock stable all the time... no issues for CPU and RAM and no issues for other validations only moments before. So the score will not be valid with this kind of validation remark? PS. Hope, it not will be a problem for somebody. GTX980 MATIRX will be in da house? I dont want promise any, because it depends not from me... but you should know, i will try do my best! I also have no fix for this... It's a bug from XTU and I also found no way to get it running, even after hours of testing, installing several/different OS etc.! The graph for CPU Mhz should be enough... it has to be OK or 80% of the XTU results will be invalid! Guys as I always say XTU piece of Poooooooooooooooooooooooooooooooooooooooo!!! Strange, we all use the same program, why did it work on some rig and not on other ? XA and Perica_barii : Did you used 5.1 ? Look like it work on your system. Or it's only bug on seven ? 22nd is the 2nd birthday of my little daughter...but if I qualify...i am in! All settings are straight from bios.. I do not change any settings under windows, i don't even have TurboV Lite installed and still 0Ghz and no temp. Probably you need to install drivers for unknown device in device manager so it become "Intel device" - the driver is part of OC pack. Futuremark helps when deleted results must be restored. That was a great idea to make weekly prizes during contest - loads of strong results every Friday make it interesting to check AOOC page every day. I can't understand how you guys can reach that xtu result. I've try today with memory on ln2 @ 1400 8-12-8-28 subtimings, rtl, boundary all tight and i can't go above than 1308. There's some magic stuff? which version are you using guys? 5.0? RULE, 1330+ easy with highest memory frequency and tight timings. sorry guys....it's valid the score when xtu say 5.11 cpu and 5.01 cache ???? slamms , if few participants will get the equal number of points ? I think decision will be based on HWBot ranking, so higher will overclocker, which submitted scores first. and what about overall rankings ? now 4 ppl from 12 to 15 place have 24 points . how to decide who will be out ? what benchmark in this case define their rankings ? Greece guys, please double check, that your actual scores and pictures is correct. Please kindly let me know, that you 100% sure in your scores and pictures of setups. If something wrong, please edit ASAP. Thank you! After rechecking with Vlad we decided to set Fire Strike Extreme as deciding benchmark. If 4 ppl from 12 to 15 have the same amount of points like you say we will go by the highest Fire Strike result. I checked my results (and photos) and I guess that I am ok from my side. All I can find in my submissions is that the vga in this score is a Titan Black and not a 780ti but I thought it would not be a problem. Why is it a problem an ASUS Titan black should be fine?? The Titan is in the picture although the run is made with a 780ti as it is also reported by XTU hardware.If it is a problem let me know so I can fix it. Ok I will fix it as soon I get back home after work. Phil, problem is not in Titan and so on. Guys, i gave a time for checking and confirmation. I am still waiting for latest information, then i will announce my decision. Vlad if you mean we are suspicius for harware sharing,then like this are the half of the others submissions.We are three guys that partially bench together and share tweaks,OSs and hardware that is allowed by hwbot rules.It is logical to have close scores,like others from same countries/teams. i don't understand what the problem is, i put so much effort this year to produce these scores why should apologize for? I have no problem personally,i was just pointing out a possible cause of problems. Based on what? Did they honestly bothered to move the setup on two different bench tables for the sake of fooling us? Guys, let`s stop this discussion. Each one can use all same HW for everything, except CPU for 2D and except VGA for 3D. I think we all know what is allowed and what not! Because I don't have proof for having a card of my own at the time(I used a card that was for sale and after testing her I send it back to owner because it was crap) I will remove my FSX score and I guess everything will be fine. Phil only losers care!! No one else does. I am sure your fine. First pick will be from 8Pack. Ian, please wait final confirmation from HWBot stuff, they should check all scores, then we will inform you, that you can do a choice. Thanks Ian.Congrats for first place. 5. Twisted1 – 52 pts. If i did not miss any, John White and Maedros see you in Moscow! I make calculation on my own for PAE, and I find same total. So you are right or I made the same mistake . Are all other results were also checked by hwbot crew, so ranking is final? Not checked yet. We will inform you guys as soon as the ranking is final. Guys do I pick team mate yet?? as it says if I dont do it today I loose my pick. Simply pick in advance your scores are valid! Scores checked. Ranking is final. Thanks Christian for quick ranking validation!! What about PAE team and with SVEN's broken FSX? Hold on guys. Massman just told me that the engine does not update the ranking after the time is up. So we have to wait until he manually recalculates the ranking tomorrow at the office. Should be fine tomorrow morning (europe time). I pick Der8auer. CaseKing OCUK Destroyers!! Yeah...nice team...if I am allowed to pick now....benchbros! Andy my friend...your first Wodka after the SIEG!!! Hope we will kill others bro) Cheers for choosing me! Giorgio and Michal will be a VERY strong team... where very long sub0 experience meets insanity! So all teams should be clear now! Here in Germany visa is around 39€ + two time trip to embassy which is around 300km. Some interesting teams are lining up for the Final. It will be nice to see how you will manage the competition with new team mate. Good luck all! Team8: Who are the top 2 Pentium AE? First of all the invitations!